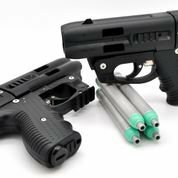 JPX 4 Shot Pepper Spray Gun - Moar Stuff - You don't need it but you know you want it. 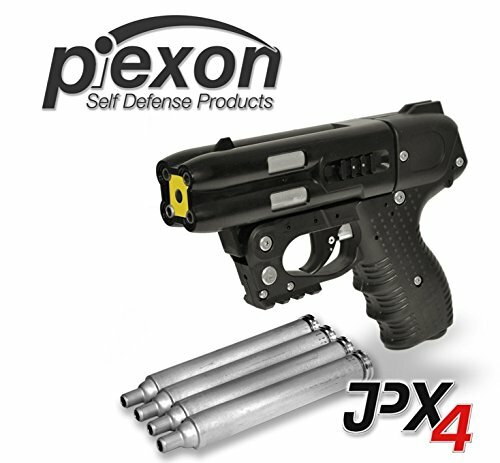 Originally offered only to Law Enforcement, the JPX 4 Shot Pepper Spray Gun is a bit different than other pepper spray devices. 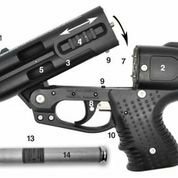 Instead of using an aerosol, this gun actually uses a primer (just like a real gun) to shoot the pepper spray up to 23 feet (7m) at up to 320 FPS ( 97.5 m/s). Despite using a primer, it is NOT considered a firearm by the ATF. It hold 4 shots and fires an exceptionally potent liquid 10% OC. The ease of training and the power of each super-strong pepper payload has made the JPX very popular among law enforcement and corrections professionals world-wide. Reloading is fast and easy, just pop the gun open (break-barrel style) and swap out cartridges. You can load each round individually so that you always have 4 rounds available. Need reloads for your JPX 4? Get a 4-pack of OC cartridges. It includes a built-in laser sight and a small picatinny rail that could be used to mount a flashlight. The JPX4 feels weighty and solid in your hands and the Swiss clock-like craftsmanship is immediately apparent. The unlocking mechanism for the chamber to load the pepper canisters is as smooth as a pocket knife. It might be a bit costly, but it’s really the best thing in non-lethal self defense on the market. LE quality OC pepper spray gun. It’s not considered a firearm by ATF. Lightweight at 16 oz empty and 20 oz with 4 shots.